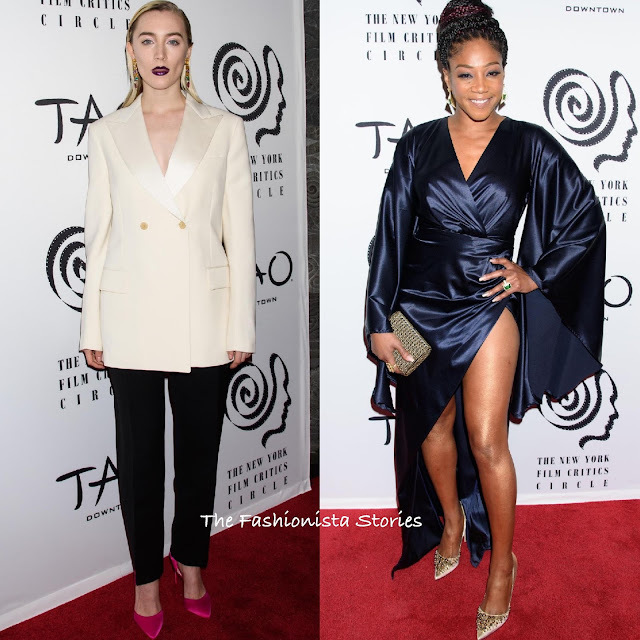 Along with Greta Gerwig & Betty Gabriel, Saoirse Ronan and Tiffany Haddish attended the 2018 New York Film Critics Awards at Tao Downtown in New York last night(January 3rd). Saoirse Ronan who was on hand for the Palm Springs Film awards, wore a CALVIN KLEIN ivory jacket and black ankle length pants. The jacket appears to be a little big on her but I do like the look. She vamped up her look with a dark lip color. DAVID WEBB earrings and fuchsia satin pumps finished up her look. Tiffany Haddish showed some leg in a WALTER MENDEZ navy silk dress with kimono like sleeves and a asymmetrical split detail. Instead of wearing a statement strappy sandals, she opted for embellished pumps. A complimentary beauty look and gold accessories finished up her look.